To make a donation through PayPal, please select the button on the right. Otherwise, please continue to the form below. Please consider joining our CIRCLE OF FRIENDS – Become a Recurring Donor by Selecting Recurring Donation Below. Yes! I would like to receive periodic information from Ronald McDonald House Charities of Tampa Bay, Inc.
It’s easy and convenient. Each month (quarter/year) your contribution is transferred directly from your account to ours. You can increase, decrease, or suspend your giving at any time and you will receive a tax receipt for your cumulative giving at the end of each fiscal year. More of your dollar goes where it is needed most – to the families of hospitalized children. Automatic giving drastically cuts down on paper and processing fees. Not to mention, less waste is good for the environment too! It’s good stewardship. When we can count on a steady income, we can seize even more opportunities to provide a “home-away-from-home” for hospitalized children and their families. Your donation to the Ronald McDonald House helps families stay close to their sick kids. • Major Gifts: Make a pledge by emailing Joo Hooi Albritton or calling her at (813) 258-6430, ext 3. • Matching Gifts: Many employers will match any charitable contribution made by their employees. Download the matching gifts form. Call us: (813) 258-6430, ext. 3 for Business Manager Joo Hooi Albritton. 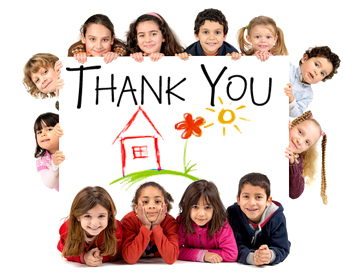 Thank you for your continued support of RMHC Tampa Bay.